We reviewed the recent literature to identify and summarize new research surrounding anterior cruciate ligament reconstruction (ACLR) with augmentation in the form of additional soft tissue procedures or biologic augmentation. Specifically, we wanted to review the failure rates of these procedures in both the primary and revision settings. The databases Embase, PubMed, and Medline were searched on August 13, 2018, for English-language studies that reported on the use of anterior cruciate ligament reconstruction (primary and revision) in conjunction with either soft tissue or biologic augmentation. The studies were systematically screened and data abstracted in duplicates. Advancements in ACLR surgery, including soft tissue augmentation, may decrease primary and revision surgery failure rates for high-risk patients. The use of biological augmentation has shown histologic and radiographic improvements. These differences, however, have failed to be statistically significant and have not resulted in clinically significant improvements in outcome. The limited body of evidence has shown that the addition of soft tissue procedures may in fact lower the risk of graft re-rupture rates particularly in revision or in patients wishing to return to high-risk sports and activities. The use of biologic augmentation although promising in laboratory studies has yet to show any significant clinical results and therefore will require further studies to prove any efficacy. Michael D. Riediger, Devon Stride, Sarah E. Coke, Adrian Z. Kurz, and Andrew Duong each declare no potential conflicts of interest. Olufemi R. Ayeni is on the speaker’s bureau for Conmed and Smith & Nephew and is a section editor for Current Reviews in Musculoskeletal Medicine. Alessio-Mazzola M, Formica M, Russo A, Sanguineti F, Capello A, Lovisolo S, et al. Outcome after combined lateral extra-articular tenodesis and anterior cruciate ligament revision in professional soccer players. J Knee Surg [Internet]. 2018 Sep 18 [cited 2018 Dec 5]; Available from: http://www.thieme-connect.de/DOI/DOI?10.1055/s-0038-1672120. 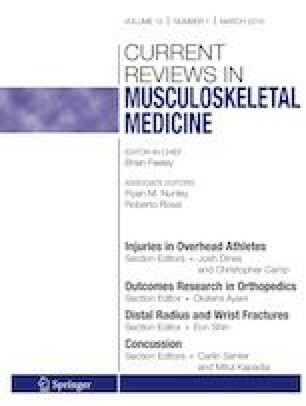 Lu H, Chen C, Xie S, Tang Y, Qu J. Tendon healing in bone tunnel after human anterior cruciate ligament reconstruction: a systematic review of histological results. J Knee Surg [Internet]. 2018 May 21 [cited 2018 Dec 17]; Available from: http://www.thieme-connect.de/DOI/DOI?10.1055/s-0038-1653964.